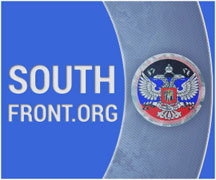 The beginning of a new phase in the war has become a fact in the Donbass. Nobody can talk about any violation of the ceasefire regime–the ceasefire has been simply dismissed. Ukrainian propaganda speaks of retaliation by the punitive forces who have been forced to respond to the seizure of the airport. However, it is difficult to use this term for such a massive bombardment and mass troop and armour offensive by the military—it was prepared long in advance. In fact, Kiev simply provoked the Militia to capture the airport, constantly hitting residential districts in Donetsk, killing, according to various estimates, around 300-350 civilians from September onwards. At any rate, the second stage of the war has become a reality. Now, both the punitive troops and the Militia must prove that they have used the duration of this strange truce to their benefit. The UAF offensive is running along the same lines as the summer scenario, not because Ukrainian generals are stupid—but rather because the configuration of the front line leaves no other options. There is one—operational encirclement of Donetsk by flanking it in the Snezhnoe area and by a tactical seizure of Yasinovataya, Makeevka and Khartsyzk. Cutting the Militia off from the border, as in the summer, makes no sense. It would be enough to cut off the supply and to attempt to hold the situation for at least two weeks. Intense fighting will deplete ammunition, and without replenishing it Donetsk simply will not hold out. Russia, continuing to adhere to the denial of its presence and to recognition of the “unity of Ukraine” will be forced to stick with it. Changing this position requires a very serious study of the consequences, for which there is simply no time now. Apparently, the Minsk “peacekeepers” did not even consider the possibility of a transition by Kiev on to the offensive and thus expected that the rather demonstrative build-up of Militia forces would in itself hold the junta back from large-scale hostilities. Thus, the Kremlin does not demonstrate anything that could be described as advance planning. Another “terrible Russian silence” has begun, or rather—in Moscow they do not know what to do. Quite pathetic statements and concerns—purely reflex actions that are typical for Russian politics as a whole. Evidently, there will be implemented the same reflex momentary plan for holding positions and thus positionally defeating the advancing punitive troops. Without a plan of attack the game is on defence—a sure path to defeat, but nothing else appears to be available. One can expect for a while exclusively defensive actions from the Militia in Donetsk and possibly diversionary attacks in other directions to force Kiev’s commanders to hold back their reserves. However, when such tactics bring the whole situation to a “slackening”—it will be enough for the punitive troops to be successful in any of the areas, and then no diversionary attacks will help—everything will be thrown into the breakthrough. 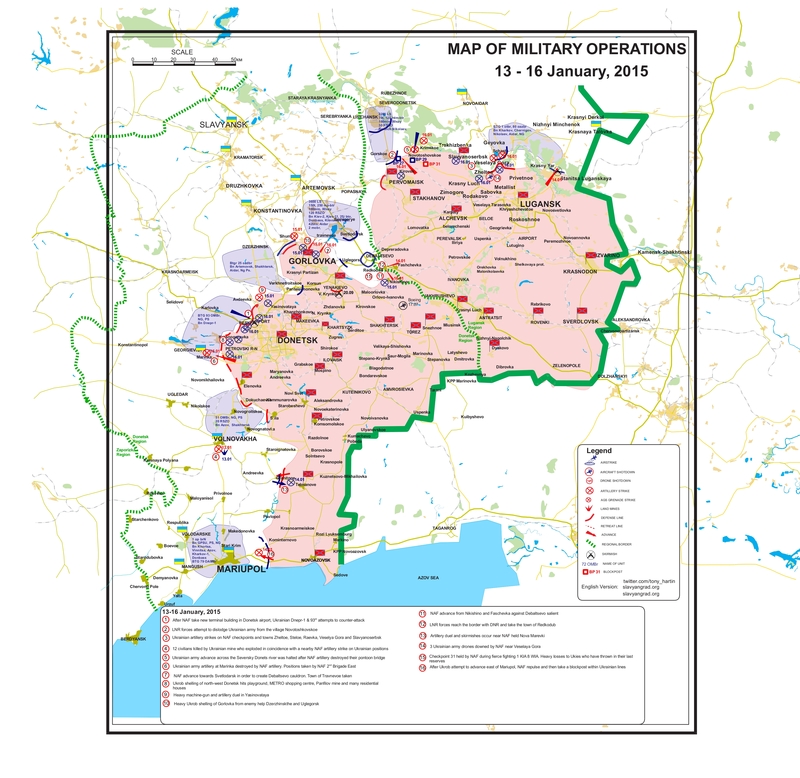 It is somewhat naïve to count on the fact that the Militia will wear down the enemy in defensive battles and then go on the offensive—not for that did the Kremlin rigidly halt the offensive in September, only to allow it, for some reason, in January. The goal remains unchanged—to pass the Donbass under the control of Ukraine, at any price, but with a pro-Russian administration. Actually, now people are being killed just for Zakharchenko and Plotnitskiy to become Ukrainian governors. If it will not be them, it will be someone else. Personalities are not important—functionality is. Kiev is not satisfied with such an approach. Strictly speaking, this was why the situation became aggravated. Currently there are no signs that Kiev and Moscow are ready to resolve the problem at a stroke, so if the punitive troops do not achieve any decisive progress within a week or ten days, the intensity of the fighting could seriously decrease. Then again will be declared an incredible victory—a return to the peace process. Until the next exacerbation. In the meantime, in addition to the shelling more unpleasant news arrived for the people—the Akhmetov Foundation suspended the delivery of humanitarian aid. Until the situation is clarified. He appears to be fine, according to his friends. Unless Kiev can regain full control of Avdeevka and environs, the Yasinovataya – Khartzysk scenario looks pretty unlikely. 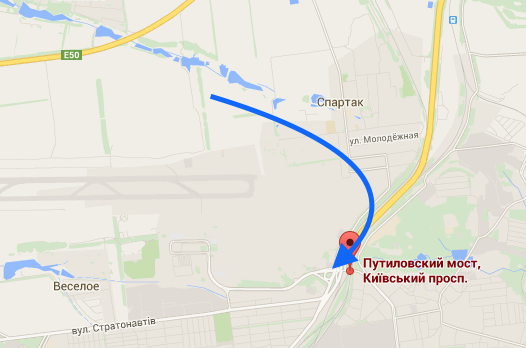 And the UAF in the Avdeevka salient – the base for a thrust towards Snezhnoe – also lost ground after getting mauled. Kiev has already called for another “ceasefire” and gotten no response. Kiev also just started to make noise about “Russians,” which is suggestive of a Plan B in the works as acknowledging loss of the airport (with Pisky and Avdeevka slipping) becomes inevitable. That would be to drum up support for more pressure on Russia to put pressure on DNI to grant a ceasefire. That raises the question of how much leverage is left to put pressure on Russia. Oil prices are already low enough to damage the western shale gas project; Russia has replaced the southstream project with the Turkstream project and completed large deals for energy and armaments with China; and Europe’s economies are looking precarious. The most likely scenario seems to be Kiev throwing in all they can spare to shore up their position north of Donetsk while hoping western pressure on Russia can get them another reprieve. If Poroshenko doesn’t get one soon, his problems with his own camp are bound to get worse. What on earth is DNI? Only one thought, “Bloody impasse, if the Kremlin went fully into protecting Novorossia, then Washington/NATO/Western Media would be ALL OVER “Russian aggression” and pumping even more for sanctions and even all-out war against Russia … and at least 80% of Westerners would swallow it whole, just like they did throughout the Cold War, the Vietnam War and the more recent wars against Iraq, Afghanistan, Libya and Syria. There is no limit to the gullibility of “the general public” in the West, so whatever Putin/Russia does, it will be wrong. So, in my view now, it is time to launch full defence of Novorossia and hang the consequences, as Putin has promised to do (more or less) without actually doing anything so far. The Junta forces are easy to locate and destroy. Just do it and break this stale-mate orchestrated by Washington. Putin’s wish to preserve the Ukraine intact is dead. The Ukraine “the borderland” is no more. The RF is reluctant to absorb the economically crippled, Russian South East of the Ukraine, but why pander to the Galician NAZIS who want only genocide against anyone speaking Russian. Much as I admire Putin in many respects, he and his team are failing now, both geo-politically and economically, for want of clear action on any front. I’m not sure the Russian leadership much cares about Western public opinion at this stage. It’s restraint in Donbass has much more to do with direct signals to the Western leadership, ones which the West has either been ignoring or seeing as signs of weakness whilst simultaneuoulsy decrying Russian actions as aggressive. Seems to me that the Russian restraint in Donbass is to buy time for its eastward expansion via trade deals pending the establishment of an alternative financial trading system (to SWIFT) and major resource deals with China and the rest of BRICS. Russia is paying for the extent of its reliance on European consumer and manufactured goods, but in the long term it has the economic strength to become self reliant in the manufacturing, financial and service sectors without becoming overly indebted. Russia has to basically buy time to allow the new trading systems to take effect and for more countries to engage with it and China to de-dollarise world trade, especially in energy resources, and IMO that is the reason for its restraint in Donbass, providing only covert and “plausibly deniable” support to the resistance. Overtly overruning the east of Ukraine, let alone anything west (and north, counting Kharkiv) of these provinces could provide the West and NATO excuses to engage in more destructive activities, both to itself and Russia, which Russia is not willing to precipitate at this stage of its economic restructuring process. I hope you are correct, what you’ve expressed is very similar to what I’ve thought too. I disagree with both of you. Russia still needs the US (and its European satellites) much more than the US needs Russia. For all its evil, the US remains the most dynamic, advanced and advancing, country. Yes the US is drunk with power, and yes, it does not care about others’ losses. But, you know, these things happen, and the thing to do is to not shut your doors, but gently remind it that Russia is powerful too. It is best to leave the idea of fairness out of politics. The losses arising out of US’s madness pain me too, but the US’s behaviour is merely excessive — it is not qualitatively different from how any state behaves. For example, Israel is slowly, but openly, ingesting the whole of Jerusalem. Where is the Russian outrage on this? Or where is the Russian outrage on the gunning down of about a thousand unarmed people recently in Egypt? And I don’t disapprove of the lack of outrage. This is how politics is. To turn away from the US to China would be behaving like the proverbial donkey forever shuttling between two piles of hay because as soon as he reaches near one, the other pile looks larger. Would China be more considerate of Russian interests? You can be sure that it will act only in its own interests! A breakdown between Russia and US is possible, but nobody should wish for it. Gerry, if Russia attacks now, that will be an official act of war against a souvereign country and NATO partner. This will be a political escalation and will give the US military-industrial-complex the enemy it has been trying to manufacture for decades to come. The situation is actually quite awful for Putin. Whatever he does, he wrongs someone. If he intervenes officially and directly, he will make Russia into an aggressor and Russia will be crucified for this in the western press (where there is scant realization of ukrainian war-crimes against the civilian population). And if he does not intervene, as he does now, he will be crucified by his own people for not protecting the russian-speaking people in the eastern ukraine. Whatever he does, he will wrong someone and possibly everyone. That´s a bad place to be as a politician, especially with a big part of the intelligentsia and a big part of the media in your own country being against you. The “media & intelligentsia” opposition are marginal. Well said, nothing Putin does will gain the US or EU approval. The UK with it’s Eton educated buffoon will always look for ways to ingratiate himself with Merkel and Obama. Both hate Russia, so naturally does DC(David Cameron), not that he would need an excuse. Socialism is anathema to the Corporate owned Tory party. Putin is doing all the right things for Russia’s survival and has his hands tied with regard to Ukraine. If the US can incite trouble in Serbia and Macedonia and try to get Erdogan out what do you think the US would do if it could prove Russian Troops were “sent” by Putin. The EU/US would impose further crushing sanctions. Like it or not, China is a better option, esp. if India and Australia(who hate us Brits) decide to opt into AAIB, Russia has no other friends unless a socialist party does manage to get in 2020 UK. The Donbass region of the Ukraine has successfully brought back to the state of 1945. Most of the infrastructure is destroyed, many buildings are demolished or damaged beyond repair, the groundwater is poisoned by spills from broken pipes and vehicle wrecks, the land is littered with mines and unexploded ordnance. Who will pay for the reconstruction? Ukraine? Russia? The European Union? The rebel-controlled parts of Donetsk and Luhansk are a wasteland, a depopulated area which in its present state cannot even support the few which have stayed behind. Is it worth the sacrifice if the price in the end is a barren piece of land? The only justification to keep on fighting is to destroy the Galician neo-Nazis and foil the plans of the imperial strategists in Washington. Until now the Ukraine suffers, Russia suffers, the EU is inconvenienced. The USA is unaffected, they just deploy their agents, pay bribes, keep their propaganda machine rolling, send weapons. Syria, Venezuela, Ukraine will not be the last stations of the regime-change traveling show. Unless the USA doesn’t have to pay a price for these destabilization plots, the show will go on and on and on. It is comparatively cheap fun for the psychopaths in Washington. Nobody can feel safe, nobody can be sure that the homeland will not be one day in the crosshairs of the imperial strategists, Goodwill, humanity, mercy are alien concepts for the behemoth which threatens all states, friends and foes alike, and only an international isolation and containment of the beast can save the nations of the word from blackmail, subversion, unrest, and war. Porridge is still orchestrating Banderasatan’s most effective mobilization – in Novorossiya – and it is very effective. If Porridge’s valiant efforts do not continue to bear sufficient fruit, Vlad the Impaler ( 🙂 ) will perhaps hand out white feathers to the young men who have run to Russia leaving their fathers and grandfathers to fight and apply other motivational means as well such as reduced support for male refugees capable of fighting, and highlighting the females fighting for Novorossiya. As for “today’s breakthrough” canst thou not imagine one of those commanders about whom “questions arise” (and what “General”, sitting in an armchair would have the temerity ask?) watching the tanks cross the bridge and checking with his officers how many they can safely handle on our side, blowing the bridge when the attacking forces are nicely divided, and then finishing them and accompanying infantry off methodically. Try to remember that an army marches on its stomach, Banderasatan’s army has been partially disemboweled, is short of food, ammunition in some places, and most of all short on intellect. The article appears to have been written by someone who loses his nerve easily – such a person would be a danger in a fighting unit. You haven’t been there, I can tell. I don’t know about Lugansk, but Donetsk is a ‘limping going concern,’ not a corpse. Everything in the capital but total obliteration is repaired within 24 hours, including trees on the boulevards. POW work squads clear away the rubbish. The electricity comes back on where lost, the heat is on, the water is on. Give these people a few months and there won’t be a scar. They’re not afraid of work and there’s no quit in them. Given a peace, they should reach at least a subsistence level of agricultural production next year. Meat production will lag. The men and equipment to sweep and demine the fields are already organized. There’s an electrical engineer in charge now, remember, not a political philosopher. Which is why I re-iterate once again, the only way to stop the Empire of Chaos is if Russia and China have agreements in place. Iran is Russia friendly and other countries are fully aware now of what the US is capable of and they don’t like it. There is a future looming in which the US will start to lose ground – when it does, I doubt that it will have many friends. El-Murid is a professional pessimist. He regularly takes good news and tries to make it sound bad. If Akhmetov isn’t giving aid, that is good. He is a problem, not a solution. And all of el-Murid’s points are missing the bigger picture, which is what the Kremlin can live with. They tried to make a deal with the West, and couldn’t get one. So now they are going to take enough territory in the two republics so that they will be functional for the time being, and that is the minimum. They may take more, and get the war to areas where it starts to hurt Russia’s enemies. This is what would happen if the battleground became Dnepropetrovsk. I desperately hope, that you are right. Whatever happens, this conflict will morph into a long and bloody guerilla war. Don’t underestimate the hate propaganda of the Ukrainian media against Russia. All the Ukrainians who after Maidan thought that they have reached Western consumer paradise and who see their dreams dashed and their country falling in pieces blame Russia for their misfortune and feel a burning desire for revenge. One just has to read social media postings. Western Ukraine has become the most anti-Russian place on the planet and there are enough young unemployed and uneducated men willing to join the Chechen diaspora and to kill Russians wherever they find them. All the USA has to do is establish more training camps and provide assault rifles, sniper rifles, and explosives plus detonators. It worked with Jabhat al-Nusra and with Islamic State, it will work with the “Free Donbass Army” too. Social media can be heavy on posts from Langley. They cannot be trusted. Russia seriously screwed up by ignoring the ideological, cultural, and educational side of things with the Ukraine. But a large percentage of the radicals are going to end up dead or seriously injured and more may end up in Poland or Canada. And those guys will have more to lose than desperate peasants in Pakistan. Anyway, it depends upon how things go. There may be a Nazi regime soon, and also an economic collapse. Will those who had the European Dream blame Russia or the EU and US? But now the World is aware that the CIA created the monster that is Islamic State and the US is Frankenstein. There are no secrets anymore and eventually the EU will not be able to justify the Nazi presence imposed by the US. More and more open media criticism is being made of the Ukrainian slaughter of what are essentially peasants (that is how they are viewed in the west) armed with a bit of military leftovers. Just as the BDS movement is gaining momentum so too will the anti US sentiment. El Murid is a serious individual. “Pessimism” and “optimism” are not serious categories to frame a discussion about such matters. OK, he is a serious individual, that is true. I wanted to avoid the issue of who he works for. The situation in the Ukraine is so serious that it is doubtful too many players in the game are not affiliated with various powerful interests. El-Murid presents a rather negative view of things. It has been obvious for a long time that the Kremlin has a strategy of regularly playing weak. Deception is the first part of war. Remember the endless stories from Strelkov about how it was going to be over very quickly? Well, here we are. This sounds like deflection to me. Like Strelkov’s talk about the bad underlings, El-Murid goes after “incompetence”. The Kremlin hasn’t been incompetent; they have been cold and calculating. They have used the Donbass as a pawn, and it is ugly. Fortunately, Russia can’t allow the rebels to be defeated. I hope you are right. But there is undoubtedly a fifth column in Moscow who sympathizes with the West. Ksenia Yudaeva has been removed but German Gref reains influential. Sergei Glazyev is still cut short by Belousov, Kudrin, Gref, Shuvalov. As long as these people are not removed from their position Russian politics will not be coherent. Well that lot of predictions were certainly completely wrong, weren’t they? Although El Murid certainly had company in predicting the DNR would be fighting a defensive war of attrition, which would be by the book, obviously someone is doing the planning who can think outside the box. Is Zakharchenko flying solo? Has anyone seen Tsar, or heard of him, or something signed by him? Muslim Brotherhood supporters had blocked a key bridge in Cairo, and more than 500 unarmed people died when the state attempted to unblock it. One could argue that the state’s heavy-handedness saved Egypt from the fate of Libya and Iraq. This is what President Putin and Russian Foreign Ministry believe. Yet, the simple fact remains that hundreds of unarmed people were killed by the state.